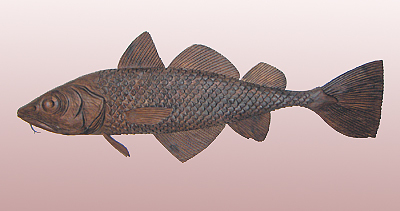 One-of-a-kind codfish hand carved from white cedar planks with a natural finish in stain and furniture wax. Fins are inset into the body and the front 'whiskers' are handforged iron. Based on an antique silver spoon given away with salt cod in the early 1800’s.